Yes, the rumors are true. We have been selected Chicago's Best Custom Frame Shop by Chicago Magazine. They had some very nice things to say about our staff and services, such as "The skill of its people, combined with their patient advice regardless of your budget and large stock of museum-quality materials, is hard to beat." Early bird shoppers getting the best deals on Outlet Sunday. The First Sunday Frame Outlet appears like a mirage once a month. We bring over a truckload of random empty frames in all sizes from our warehouse. These are frames that were cut incorrectly, the customer changed something mid-stream or are made from excess material. Some frames may have a few little bumps and bruises, but others are brand new, ripe for the picking and substantially less than full retail. Nellie models an amazing glitter frame on offer at the Outlet Sale. Normally retailing at $10 a foot, this entire frame is only $30! What a steal! The best way to shop the Outlet Sale is to bring in that pile of things you've been meaning to get up on your wall but don't want to have fully custom framed. You can feel like Cinderella when you find that perfect match of frame to art. It doesn't always happen but when it does it's magical and exciting for us all. Once you find the right frame, there are three levels to get the art into the frame. 1. 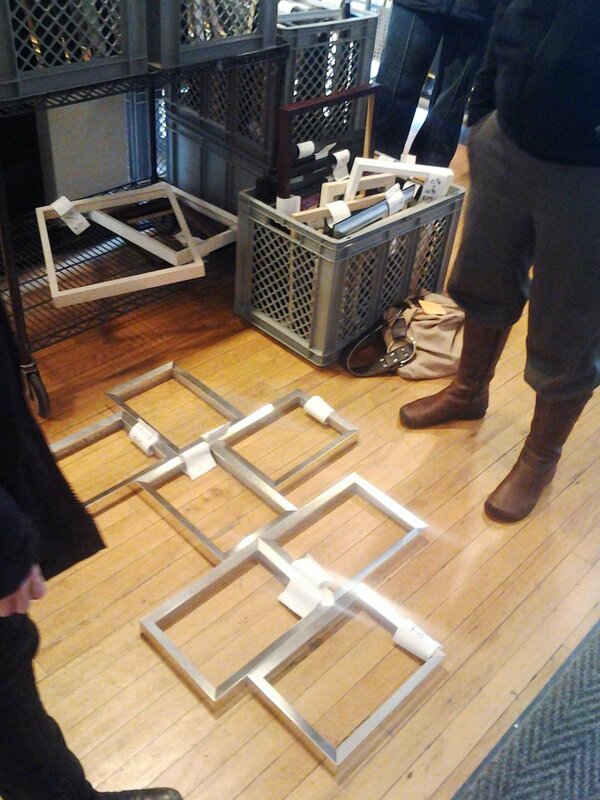 DIY - You take the empty frame home and, just like Tim Gunn, "make it work". 2. DIY Plus - We outfit the frame with glass, matting and backing. You install the artwork. 3. NO DIY - Take the frame over to our custom framers and they will help select mats and materials to get your art in the frame. All work is done by us and usually ready in a week. Sometimes you find exactly the size and style that you need. Other times, you could find something larger than your artwork and we can re-size the frame to your required dimensions. 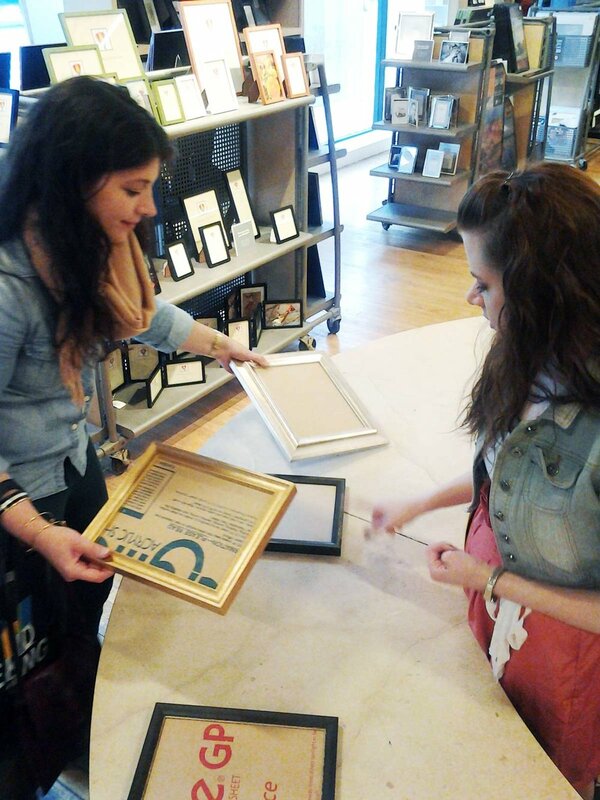 One of our framing consultants helping a customer lay out frames in the perfect design. The sale is always the first Sunday of each month in our Clybourn location only. Each sale is different and we never know ahead of time what kinds of frames will show up. We have a loyal following of "early birds" who are usually here right at 10 am to get the first look. So get those pictures out of the trunk or out from under the bed. Join us at our Lincoln Park store for the next Sunday Frame Outlet. Let's make some framing magic! Frames as far as the eye can see.